Before utilizing the RFID system, the oil company was using the traditional barcode system to confirm the ID with each machine. However, there are several major problems encountered, such as human errors, missing items and low efficiency. The barcode tags are easily destroyed. Moreover, workers need to spend time to search the barcode before reading. On the contrary, by using RFID, each tag contains a unique ID, enabling high accuracy. It also has functions like wireless communication in all-directions at an adjustable range of 0.5-50 meters as well as real time tracking. Therefore, readers can get information within its reading range, saving time for searching tags. Active tags are also durable due to the shock-proof and waterproof properties. With the replacement of barcode by 2.4GHz Active Tag with LED light, the active reader is able to record the starting and stopping time of fuel injection to individual equipment attached with an active tag.The record will then be stored in the database of the RFID system. An additional benefit which can be provided is that the system can calculate the power efficiency of using vehicle. 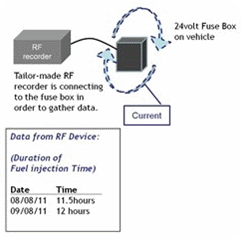 RF recorder can track data from fuse boxes installed on vehicles. The time between two consecutive fuel injections can be found. Users can then calculate how long a vehicle operates a day and thus estimate the efficiency of fuel consumption. Our RFID Handheld Reader can simultaneously perform two functions. First, it can detect equipment for fuel injection, which is for identification. The operator can then initiate the fuel injection process. Meanwhile the handheld reader will download data from the RF recorder automatically for efficiency analysis. During the process, the LED light of the particular tag will turn on so that workers can select the right machine using the handheld reader and avoid confusion with other machines nearby. The above-mentioned two functions require different reading range. The reading distance between RF handheld reader and RFID tag is around 1-1.5 meters and that between the reader and RFID device is around 20-30 meters. Our RFID Handheld Reader can automatically adjust the reading distance and download the data. To deal with the problem of wrong mapping, our RFID solutions has a clock system which can synchronize between the RFID reader and the system to make sure the reader is reading the right machine with accurate data. The handheld reader can also communicate with printers by Bluetooth and print out the receipts immediately. Our RFID system can also improve the unprofessional system used before. Previously, the company use file-based system to store data. Once the system crashed, all information would be lost. A back up arrangement is also lacking. However, by using our RFID system, the company now uses database for storage. The system will back up periodically so that any data would not be lost. After the implementation of the active RFID system, the oil company is enjoying various advantages. It can solve the problems they previously faced when using barcode system like durability, efficiency, accuracy, etc. Employees of the company can perform their tasks more accurately and at a higher pace. The company’s overall efficiency and data management standard are raised.